When U.S. Energy Secretary Rick Perry called on federal regulators to prop up aging coal and nuclear plants citing premature retirement as a threat to electric grid reliability and resiliency, we dug into several years of power outage data and found his rationale was not rooted in reality. Our Energy and Climate team tabulated reports that power companies file with regulators when there are supply disturbances. We focused on a period between 2012 and 2016 in which nearly one-third of the country’s coal-fired power plants and 6% of its nuclear plants were retired, as persistently low natural gas prices and rapid declines in the cost of renewable energy squeezed profit margins. How big of a reliability threat did “fuel supply emergencies” pose? Not much. 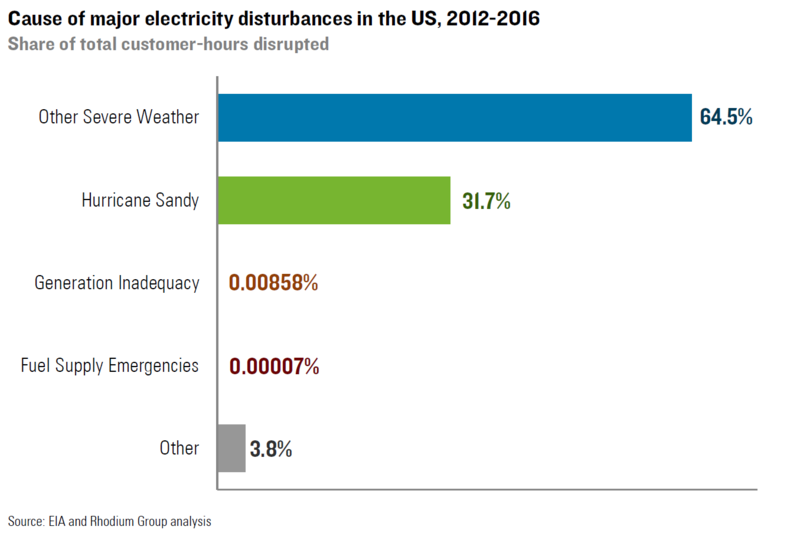 Our analysis found mere 0.00007% of the roughly 3.4 billion hours that customers endured power disruptions between 2012 and 2016 were due to the fuel supply problems. The Energy Department rolled out its proposal on a Friday. Our analysis went live Tuesday, as battle lines were being drawn. The 0.00007% figure caught the attention of influential energy press. As utility regulators, lawmakers on Capitol Hill, and the CEOs of top business and trade groups started to weigh in, the data in our report surfaced again and again. The analysis we provided made waves across the political spectrum. It was cited by 11 Democratic state attorneys general in their comments to federal regulators, and by scholars at the conservative Heritage Foundation. Debate centered on whether the growth in natural gas and renewable energy sources had created a reliability crisis, as Perry warned. If so, was it urgent enough that federal regulators needed to intervene? Natural gas plants cannot store much fuel onsite and rely on a consistent stream of pipeline delivery. Absent large-scale battery or other storage, generation from wind and solar is limited to times of the day when the wind is blowing, and the sun is shining. To assess these constraints, we conducted a second round of study, this time on behalf of clients who opposed the plan. This analysis, which we submitted to the Federal Energy Regulatory Commission’s docket, found no clear link between the proportion of wind and solar in an area’s power mix and the frequency and duration of customer outages. The New York Times editorial board later referenced those findings as part of their argument against Perry’s plan, noting it would cost consumers greatly but do little to improve the electric grid. That’s because less than one-hundredth of 1 percent of power failures between 2012 and 2016 were caused by fuel supply emergencies, according to the Rhodium Group, a research firm.